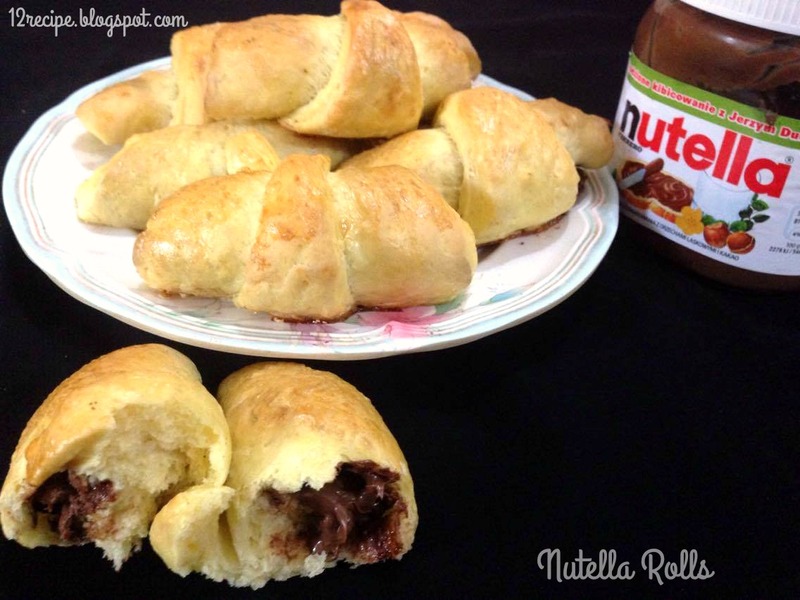 A simple homemade yummy sweet rolls filled with nutella hazelnut spread. It is a great idea for kids snack box. 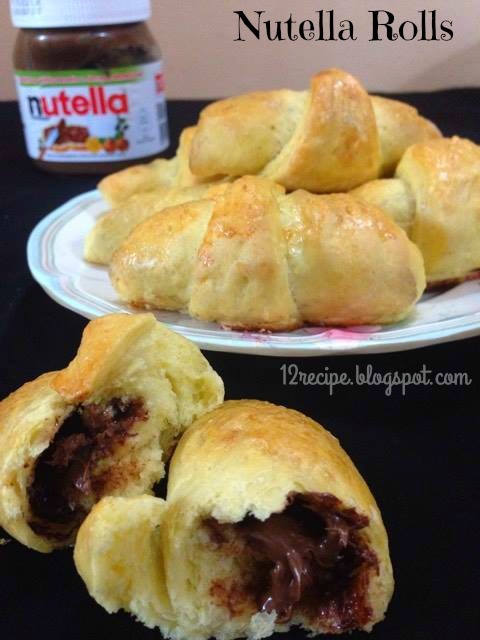 You can fill anything inside instead of nutella (jam, cheese, meat ) and make your own favorite rolls. Heat the milk on microwave or stove for few seconds until lukewarm (not hot). Add sugar and yeast in to it; mix well and let it rest 10-15 minutes (then it will become little foamy (bubbly) texture; then only your rolls will puffed nicely; so try to use good quality active dry yeast). In a bowl mix flour, cardamom powder and salt. Add melted butter in to it and crumb it like bread crumbs. Add the separated egg yolk and half off the egg white (keep remaining half for topping). Mix well; add the yeast mix in to it and make a smooth dough (if it is dry, add little water or if it is watery, add little flour to adjust). Now cover the dough with a wet towel and let it rest for two hours or until doubled. (pre-heat the oven for 3 minutes and switch off the power, after that keep the dough inside the oven for 2 hours is the better place). After the dough gets doubles in size (it will be sticky), add little oil (or use flour) in your hand and flatten the dough to a thin large circle. Now divide the circle in to eight equal triangles four diagonal cuts) by using a sharp knife or pizza cutter. Add a tablespoon of nutella on the edge of each slice as shown in the picture below. Now roll it from the wider edge to thinner edge to make a roll. 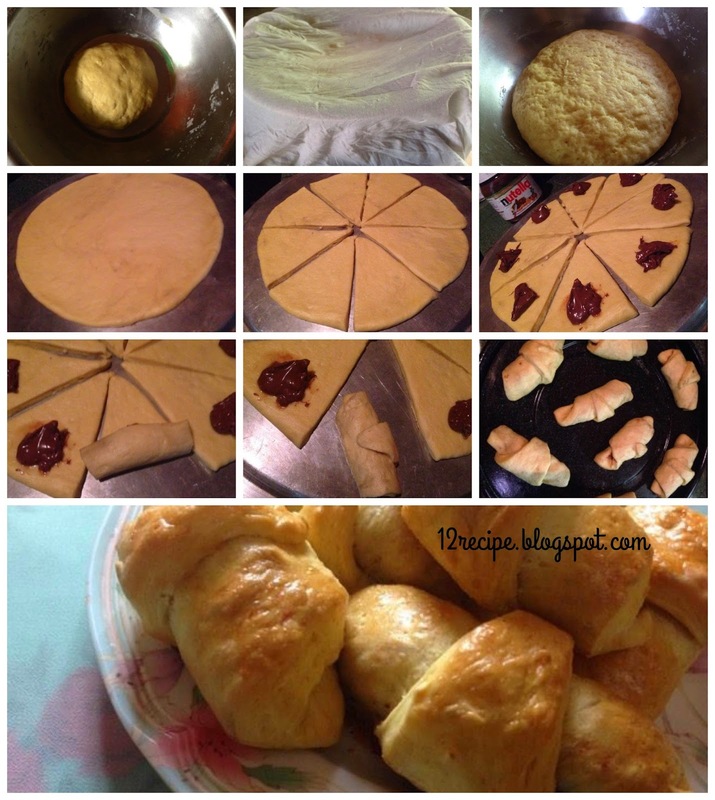 Prepare all the rolls in this way and arrange it on a greased baking tray. Brush the remaining egg white on top of each rolls evenly so that they will be nice and shiny. Bake it in a pre-heated oven (at 180 degree) for about 30 minutes or until puffed up and top gets nice golden in color (time may vary according to different oven).